TreChain Platform demonstrates its commitment to the natural resources industry with technology and shows everyone its vision of pooling natural resources with innovative ideas. What is the concept of natural resources? I believe you all have a clear understanding of resources, such as water, oil, trees and so on, but do we have a clear concept of the speed of natural resource extinction, such as how long it takes for a drop of water on the ground to circulate from nature? It takes years for a tree to grow from a seedling to a giant tree. We are vague about these specific times, but the inner concept is clear, because that inaccurate time is called a long time for us. As the pace of economic development continues to accelerate, the speed of resource consumption has been far behind the speed of resource regeneration, and the establishment of TreChain platform is to better supervise and manage natural resources, generate a chain-like ecosystem, so that every tree can follow, so that resources are no longer a simple concept, but the real existence that everyone can feel. We gather natural resources here in order to calculate the large data related to resources effectively and precisely, and then make it possible to develop circularly through rational resource allocation and effective development. As the carrier of resource economic activities, resources have many forms. TreChain platform mainly focuses on forest resources and marine resources, supplemented by other resources, carries out the operation of resource ecosystem. For forest resources, it includes forest land and all forest organisms. Most of them are concentrated in forest timber resources. At present, the most developed areas of global forestry economy are concentrated in Europe. However, with the study of the world forest economy, it is found that forest land in Southeast Asian countries, as the main means of production in mountain areas, not only becomes the guarantee of national ecosystem, but also the goal of increasing income. With the rapid development of forest economy in local governments, competent departments, forestry researchers and practitioners, the coexistence of traditional forestry and contemporary agriculture has become the mainstream form of forest economic development. In view of the development of marine resources, TreChain’s team has established a deep relationship and cooperation with the related technology company of “High Resolution Sounding Sidescan Sonar System”. This system is the most advanced marine resources exploration system in the world. It meets the needs of marine engineering and exploration and development of marine mineral resources to a great extent. It allows topographic surveys of oil fields, surveys of waterways and ports, and navigation matching seabed topography, thus opening up a whole new world for resource exploration. 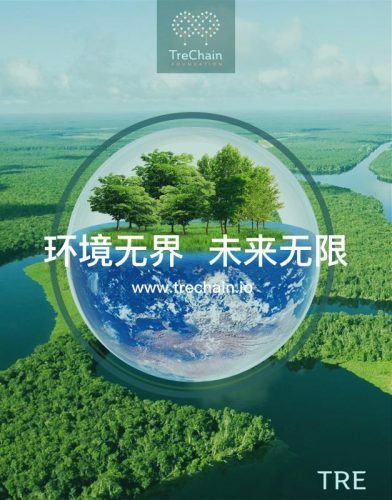 For future resource development, TreChain Platform has its own firm direction, that is, adhering to the “harmonious development of nature and human beings”, through the construction of a stable development ecosphere, to create a win-win solution for the environment and human beings, in order to achieve a harmonious and consistent pace of development of human civilization and global ecology. In view of its future development in the relevant resource areas, TreChain platform said that it has laid a solid foundation for forestry planning and cooperation with the Asia Regional Cooperation Special Fund and the Asian Investment Bank Fund. In addition, the Trevhain Foundation actively seeks industrial and ecological partners in the global economic center cities to establish a huge resource industry chain, through cooperation with well-known entities to make environmental protection and digital technology produce greater economic value. TreChain Platform demonstrates its commitment to the natural resources industry with technology and shows everyone its vision of pooling natural resources with innovative ideas. We call on more environmentalists and entrepreneurs to join us, because only when we learn to live in peace with the environment can we win the future and create unlimited possibilities for our future.